Historically, Gregorian chant is in direct, organic development with ancient cantilation — chanting — patterns of the psalms in temple and synagogue. This was the background and experience of the first Christians. So our chanting today is in direct relationship with theirs. One can see, then, that when we sing the chant, we are truly “in connection” with our fathers and mothers in the faith. In fact, it is in dispute that Gregorian chant can be traced back to Jewish temple worship. One might just as easily posit that non-Christian chanting, say, of India, or Persia, or Greek mystery religions contributed. Gentile believers overwhelmed the early numbers of Jews very early. It’s a stretch to think early Christian chant and temple worship were directly related. One can make a better case for a certain spiritual quality of a cappella singing as appealing to human ears, as we see in the use of chant when worship is conducted in confined buildings. One can make a better case for a more explicit element of rhythm in human worship: the unborn sensation of the mother’s heart and lungs. And for many cultures that worship in the open air, percussion is essential to hold communal music together when large groups assemble. It is entirely free of anything that is contrary to the faith, free of purely human agendas or experiences that lead us away from God’s will and plan for us. To use the language of our computer age: The chant is “safe and secure.” No viruses can enter. Nice try, but a little over the top. Great music of any kind, and certainly much imperfect music offered for worship is based on the openness of the composer to the spirit of prayer and the liturgy. And sadly, we’ve seen over the past fifty years that musical style is used as both bludgeon and target for people in parishes and the larger Church with their own agendas. The author, Thomas Day, suggested — among other things — that people don’t sing because the music they often encounter at Mass is not really worth the effort. Silence is one response to music that is inappropriate — whether from the standpoint of aesthetics or theology. I can agree on this point. Another factor is the disappearance of choirs from parishes, since choirs can effectively lead and encourage congregational singing. But this one is curious. Is Father Weber still stuck in the 60’s? A scarcity of parish choirs is usually attributed to the policy of assembling the lion’s share of singers at one Mass under one director. My new parish, I’ve noted, is wise and fortunate to have choirs at all the Sunday Masses, plus a weeknight celebration when the students are in class. 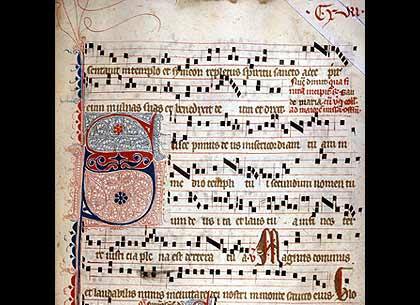 What would be helpful in the continuing discussions on chant in liturgy would be a careful study of the relationship of acoustics, size of the worshipping assembly, accompaniment, and tempo, to see if, in fact, Gregorian chant is truly the best expression for Catholic worship. I can certainly see plainsong as a portion of a parish’s repertoire: an ordinary time Mass setting plus seasonal hymnody. Many parishes already have the latter: O Come O Come Emmanuel, Ye Sons and Daughters, Where Charity and Love, to name a few. The Taize experience shows that prayerful music need not be unaccompanied. The quality of modern instruments and their sonority in sacred music has certainly changed the landscape since the time of Trent. I think an appropriate musical and cultural adaptation of chant for participatory music should be a main consideration of every parish music ministry. Father Weber’s enthusiasm for the music that formed him in his family and in his religious community is a sensibility we can value. But when exaggeration is such a big part of his argument, one has to wonder how overblown the pro-chant commentary in general has become. My comments can be found at the website listed. I find it interesting that the city that gave us the infamous Jesuits is leading musical reform. God indeed does work in mysterious ways. The Jesuits were hardly imfamous. They promoted the traditional antiphon + psalm verse format above devotional and catechetical hymnody. And to clarify, the St Louis Jesuits went to school at SLU. As far as I know, none of them were from Saint Louis.